Transcending her humble musical beginnings involving a macaroni box disguised as a violin, Chloe Fedor has since received critical acclaim for her “lovely, plush, seductive tone” (New York Times) and appears as soloist, concertmaster, and chamber musician in period ensembles throughout the country. She can be seen and heard performing with Trinity Wall Street Baroque Orchestra, Early Music New York, Clarion Music Society, The Sebastians, New York Baroque Incorporated, The American Classical Orchestra, Oregon Bach Festival, and the Bach Society of Charleston, as well as the Lakes Area Music Festival each summer. Highlights of this season include soloist for Mozart’s Sinfonia Concertante with Project Amadeus, Vivaldi’s Winter with the Sebastians, Concertmaster of Seckendorff’s Proserpina with New York Baroque Incorporated, and tours of Montreal and California. She completed her studies at The Eastman School of Music and The Juilliard School, receiving two Master of Music degrees from the latter, both in Violin and Historical Violin Performance. Chloe is one of ten Juilliard graduates to have received the esteemed Career Advancement Fellowship, and she enthusiastically continues her music-making and teaching from her New York City base. Noted for playing “virtuosically but with fluid grace” by the New York Times, violinist Jeremy Rhizor is the founder and director of the Academy of Sacred Drama. He has recently led Baroque oratorios by Stradella, Pasquini, and Scarlatti through the Academy and for the Festival of Sacred Arts in Sweden. In recent solo performances in New York City and Sweden, he has showcased seventeenth-century Italian composers such as Corelli, Stradella, and Caldara. Past seasons included a performance for the 40th Anniversary Celebration of Music Before 1800 and a recital tour in Nova Scotia. With the Academy Players he has performed French and Italian trio sonatas. Jeremy performs with many period-instrument ensembles such as Trinity Baroque Orchestra, the Handel and Haydn Society, and the American Classical Orchestra. In recent summers, he has played orchestral music at the Lakes Area Music Festival in Brainerd, Minnesota. Jeremy’s interests include seventeenth-century Italian oratorio and the relationship between the social and personal aspects of marriage and friendship. Arnie Tanimoto is equally at home playing various members of the viola da gamba family, as well as baroque cello. He was the first-ever viola da gamba major at The Juilliard School, where he soloed on both viola da gamba and baroque cello. Described by The New York Times as a “fine instrumental soloist” Arnie has performed with some of the country’s leading period ensembles, including the Boston Early Music Festival Ensemble, Trinity Baroque Orchestra, and the Smithsonian Consort of Viols. He has participated in classes and coachings with such notable artists as William Christie, Anner Bylsma, Paolo Pandolfo, and Christophe Coin. Arnie is an advocate for the viola da gamba, and can be found giving lecture demonstrations and premieres of new works for the instrument around the country. He holds degrees from Oberlin Conservatory (B.M. ), the Eastman School of Music (M.M), and The Juilliard School (M.M.). He currently resides in New York City. Elliot Figg is a keyboardist and composer from Dallas, Texas. He is a graduate of the Historical Performance Program at The Juilliard School where he studied harpsichord with Kenneth Weiss. He has also studied with Arthur Haas at the Yale School of Music. 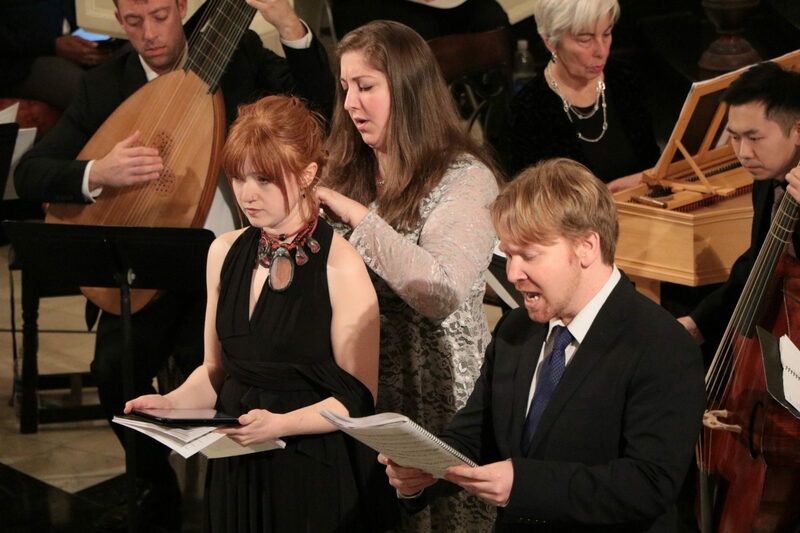 Elliot is an active member of several New York based early music and contemporary ensembles, including ACRONYM, New York Baroque Incorporated, and New Vintage Baroque. Recent engagements include: assistant conductor and harpsichordist for Cavalli’s Veremonda with the Spoleto Festival USA; assistant conductor and harpsichordist for Dido and Aeneas with L.A. Opera; assistant conductor and harpsichordist for Alcina and Orlando with WhiteboxLab. Elliot received Bachelor’s and Master’s degrees in music composition from the University of North Texas where he studied composition with Cindy McTee and Joseph Klein, and harpsichord with Lenora McCroskey. His own works combine baroque performance techniques with altered tuning systems and modern formal approaches.